Alia and Daniel, two botanists and maybe-lovers in Tree Listener, disagree about food security. On this page I will collect a few articles on both sides of the issue. Truth is sometimes stranger than fiction. Genetically engineered corn was linked to mammary tumors, kidney and liver damage and other serious illnesses in the first ever peer-reviewed, long-term animal study of these foods. The findings were published today in the journal Food and Chemical Toxicology.Article contains other useful links to peer-reveiwed studies. These folks think corporate ownership and control of the seed supply is a threat. "According to ETC Group, the top 10 multinational seed firms control half of the world's commercial seed sales (a total worldwide market of approximately US$21,000 million per annum). Corporate control and ownership of seeds - the first link in the food chain - has far-reaching implications for global food security. With control of seeds and agricultural research held in fewer hands, the world's food supply is increasingly vulnerable to the whims of market maneuvers. ETC Group's report includes a table listing many of the world's top 20 seed companies and their acquisitions and/or subsidiaries." These folks think it is not a threat. "(Moss, the speaker this writer is rebutting) assumes that every farmer and thus every seed manufacturer will need to plant seeds with biotech traits–in other words, if you’re a consumer in the output market, you are necessarily an indirect purchaser in the input market. But that isn’t true. So Moss claims there is “less choice.” But less than what? She implicitly compares the market to some ideal, theoretical world, but she has no measure of the cost of getting to that world, and no support (again) for the claim that the “competitive ideal” is preferable." These folks think it's even more sinister and are doing something about it. 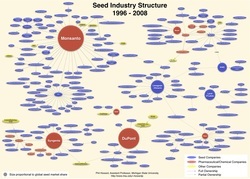 "Seed industry concentration has resulted from major pesticide manufacturers like Monsanto, DuPont, Bayer and Dow buying up half the world’s seed supply, and it has several negative impacts: 1) Use of genetic engineering to make pesticide-promoting GM crops, harming the environment; 2) Reduction/elimination of conventional seeds, giving farmers little choice but to buy GM seeds; 3) Astronomical prices for GM seeds and the pesticides used with them hurt farmers financially; 4) Monsanto’s patents on seeds permit prosecution of farmers for seed-saving; and 5) Monsanto “strong-arm” tactics with ever fewer remaining independent seed companies further reduce farmers’ seed choices and enforce the company’s stranglehold on seeds." Monsanto explains its side of the story. "Enforcing patent law is not much different from the enforcement of other laws. Most people respect the law. Often, honest citizens will report those who break the law. The same is true for patent infringement involving saved seed. The vast majority of farmers respect patent laws and honor their agreements to abide by that law. When one farmer sees another farmer saving patented seed, they will often report them. Many of the tips Monsanto gets about farmers saving patented seeds come from other farmers in the same community". "In essence, Monsanto argues that once a farmer buys their seed, they have to pay the global bio-tech giant a yearly fee in perpetuity – with no way out." Monsanto is presently threatening to sue Vermont--did you know they won their last case against Vermont in 1994? "Update April 11, 2012 -- Monsanto is threatening to sue the State of Vermont if lawmakers there pass H-722, or the "VT Right to Know Genetically Engineered Food Act," which would require manufacturers to label products containing genetically modified food. Consequently, lawmakers have put a hold on any vote on the bill. This is typical behavior from the behometh agribusiness, which has forced competing farms out of business and sued organic farmers for "drift" that contaminates their crops with Monsanto seeds. And Vermont has faced Monsanto's wrath before. Back in 1994, the state tried to prevent dairy corporations from marketing milk with containing the rgbH growth hormone, arguing that it was linked to cancer. Monsanto won back then. Which may explain why the current lawmakers have postponed voting on the Right to Know bill. They know exactly what they are up against." Biotechnology giant Syngenta has officially been outed for deliberately hiding data that proves the company's genetically-modified (GM) Bt 176 corn is directly responsible for killing livestock. Dr. Eva Sirinathsinghji writing for QW Magazine explains that Syngenta is now facing criminal charges for willfully concealing the results of an internal, company-run study on Bt 176 corn from 1996 that was abruptly ended when four cows died after just two days of consuming the "Frankencorn." Gottfried Gloeckner, a German farmer from Woelfersheim, originally filed the suit roughly a decade after dozens of his own dairy cows died from exposure to Syngenta's Bt 176 corn. Gloeckner first began feeding his cattle Bt 176 corn as part of their diet back in 1997 when Syngenta gained government approval to run field trials of the crop on Gloeckner's property. And by 2000, Bt 176 corn was the only thing Gloeckner was feeding his cows. Now we are indoctrinating kids in school? Well, perhaps your own children can put your mind at ease, for science teachers around the country have been assigning a book called "Look Closer at Biotechnology" to the kiddos in their classes. It's filled with colorful images, friendly cartoon faces, puzzles and more! The very first page makes clear that the scientific wonder of genetically engineered foods pose no worries at all. "Hi, kids," it begins. "This is an activity book for young people like you about ... a really neat topic." Why is it so neat? Because, say the authors, "as you work through the puzzles in this book, you will learn more about biotechnology and all the wonderful ways it can help people live better lives in a healthier world. Have fun!" Fun? With genetically engineered food? That's not fun, it's serious business — and look who's behind this book of fairy tales: the Council for Biotechnology Information.